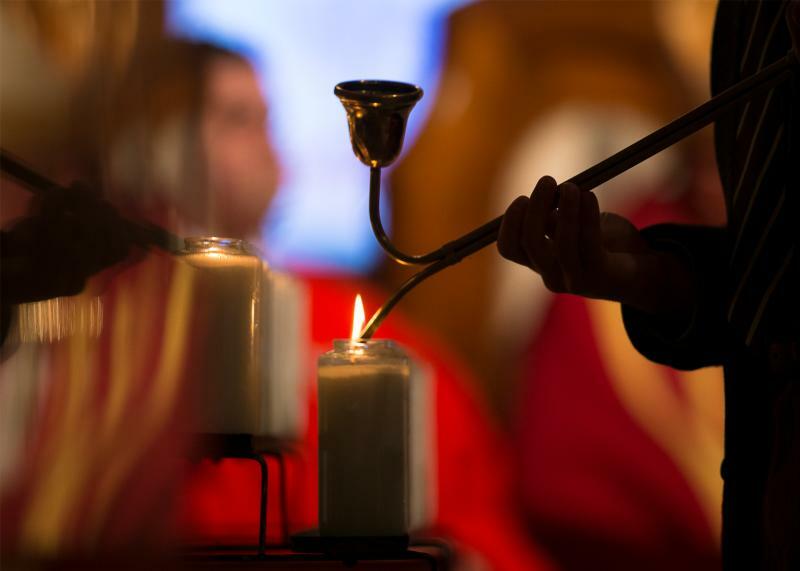 WASHINGTON (CNS) — Catholic churches throughout the world were bathed in soft red light to honor martyrs and mark the “Courage in Red — Stand Up for Faith and Religious Freedom” campaign sponsored by Aid to the Church in Need. 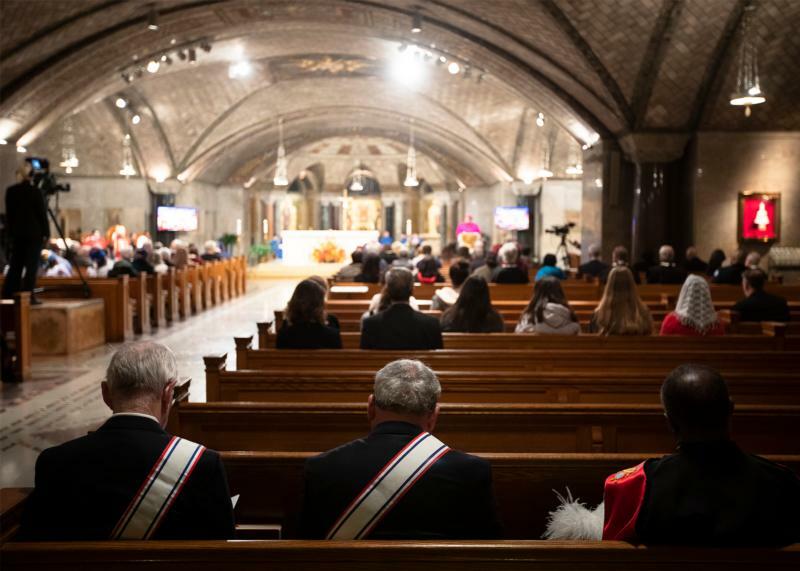 So it was Nov. 28 at the Basilica of the National Shrine of the Immaculate Conception, where a quiet vespers service, “A Night of Witness,” commemorated the martyrdom, just in the last two years, of some 22 members of the priesthood, most of them in Mexico and South America, and 82 others killed in terrorist attacks in Pakistan and Egypt. Most martyrs are killed anonymously while simply going about their jobs before being caught up in the violence from civil wars and terrorist groups. “They may not be on the covers of magazines. They may not ever make the news. But they gave their blood for the church,” observed Msgr. Vito Buonanno, director of pilgrimages at the basilica. “Tonight, we seek to remember all of them,” said George Marlin, chairman of Aid to the Church in Need, is an international papal charity that provides pastoral and humanitarian aid to persecuted and oppressed Christians and supports various church projects in more than 140 countries. “The church in Iraq,” he said, “is a martyr church. Since 2003, 61 churches and shrines were burned, destroyed or bombed. Over 25,000 homes seized. 150,000 Christians were displaced, and most since 2014. Countless Christians have been kidnapped or murdered. A bishop, three bishops and six deacons were murdered. “We are closer to God in our suffering. St. Paul said, ‘I want to know Christ.’ Yes. To know the power of his resurrection and participation in his suffering, becoming like him, in his death,” the archbishop continued. With the group now largely driven out, Christians returned to find houses of worship destroyed, “but the good news, is that our people have unshakable faith,” Bishop Doeme said. Sister Annie Demerjian, whose ministry with the Sisters of Jesus and Mary has been in Aleppo, Syria, spoke of the long-term damage to children from the ongoing civil war there. In a century of continuing scientific advances, “How come men have not yet found a way of living in harmony, justice and peace with one another?” she asked. Other services in the preceding days were held at the Co-Cathedral of St. Joseph in Brooklyn, New York, St. Francis of Assisi Cathedral in Metuchen, New Jersey, and Epiphany Cathedral in Venice, Florida. Those churches and the national shrine in Washington were illuminated at dusk by red lights. The “Courage in Red’ campaign in previous years has illuminated Westminster Abbey and the Houses of Parliament in London, the Colosseum in Rome and the Christ the Redeemer statue in Rio de Janeiro. This year’s “Courage in Red” also illuminated landmarks including Sagrada Familia Cathedral in Barcelona, the Sacre Coeur Basilica in Paris, Westminster Cathedral in London and the Basilica of Santa Maria della Salute in Venice, as well as the Rialto Bridge and parts of the Grand Canal there.